This frosted glass Mexican star light is a wonderful way to update your interior light fixtures and add a warm glow to your home. These whimsical star lanterns are taken from the Moravian tradition and make beautiful and elegant additions to southwest decor year round. 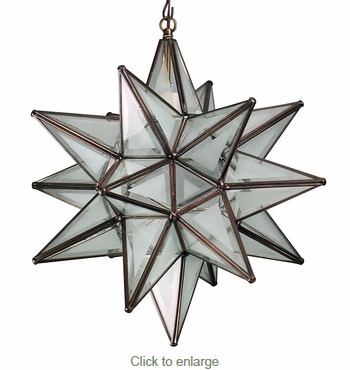 These hanging star lights are handcrafted in Mexico by talented artisans. Lit star photos show the difference between using a bright white or daylight bulb versus a soft white bulb. The soft white will have warmer hue.